I have to be honest, e-commerce startups in Zimbabwe haven’t completely won me over. That’s not to say there aren’t any teams doing a lot of impressive work in this area already. We’ve seen successes and some areas where problems are being solved. A new classifieds platform recently caught my attention. Called Save Mari, it is an online platform to market, advertise products in Zimbabwe. According to the information we obtained from the the site’s contact information, the marketing site is managed by individuals based in the United Kingdom. Think of it as another classifieds.co.zw. The website is definitely curated for the domestic market in Zimbabwe. There is a drop-down menu that allows users to select goods based on the location of the seller. Almost all of the national provinces can be selected. Users can also search the products according to categories ranging from Baby Corner to Watches and Jewellery. Buyers are able to see pictures of goods on sale and contact information of the seller. To market goods on the site, sellers have to first sign up for an account. They also have to pay for ad space using the PayPal payment platform. The cost of banner ads ranges from $15 to $40 per week. New dog leaning on old tricks? Currently, this e-commerce platform is in its infancy so there are some issues that need to be addressed. The functionality looks a bit unpolished and most of the sellers are based in Harare. Several adverts were for properties and goods in Harare. At the same time it’s hard to not look at this as another attempt at figuring out classifieds listings in the same way that incumbent players are doing it. There are a slew of guys that have been solving some of the problems that Save Mari is trying to address, a shortsighted approach that has plagued a lot of aspiring startup entrepreneurs. Classifieds services seem like an easy way to get into e-commerce through basic templates, but the real Alibaba-like hustle lies in figuring out the business side of things. This means relationships with traders, offering them value and figuring out how the users respond to site features. These are some of the bitter lessons that the team at the local market leader, classifieds learnt the hard way. While I’m not impressed by this as just another attempt at classifieds, l can’t definitely say what the future holds for the traders on Save Mari. If it responds to the market, figures out a specific challenge to address and a highly significant number of people use the service, it might just become a platform to reckon with in the future. If Save Mari becomes big and disrupts the e-commerce sector in Zimbabwe, it might even be able to suggest what you want using machine learning technology. Hour Of Code Zim event scheduled for the 4th of July; why should we care? I like your thinking on machine learning cliff. But this is about Big Data and Business Inteligence. I doubt that at this stage these guys can mine enough data, let alone run the stats to do predictive analytics. Its a skill thats still very rare in many zimbos, at least from my experience with people i have worked with. But thats definately the way to go. The ealier we adopt that new skill in zim, the faster we are to make our business models work. Thanks, LJ. I am suggesting that if SaveMari stays around for a long time and a significant number of people join the site, they can mine data since they will then have enough of it. It’s just my futuristic thinking. l will re-phrase it so that it doesn’t seem like l am suggesting they use machine learning right now. While I admire their effort I think the site needs work. The security for example is lax. They are using WordPress: Directory Indexing is On!! !, User enumeration On. 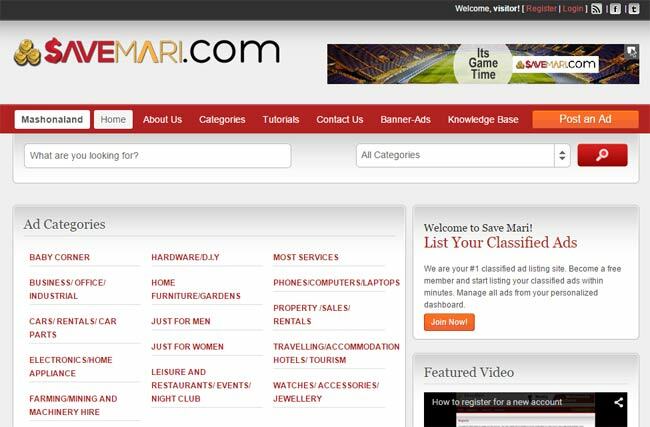 I personally think Zimbabwe needs more platform to advertise and savemari.com is welcomed.as a Zimbabwe an business man myself,I think competition my lead us to more choices,better quality of service and more professionalism in all sectors. I been to their websites and I a gree, they is more to improve on their website, am sure given enough time these guys can better and am sure they is more to come from them..